George Observatory at Brazos Bend State Park by Andrew Fritz. There are some amazing photographers that wander the halls of HMNS – and our satellites southwest of Houston. When we’re lucky, they share what they capture in our HMNS Flickr pool. Each month, we share one of these photos here on the blog. As the weather gets warmer, you may be starting to think about how to get outdoors to enjoy this brief period before our infamous Houston summer gets well and truly unbearable. 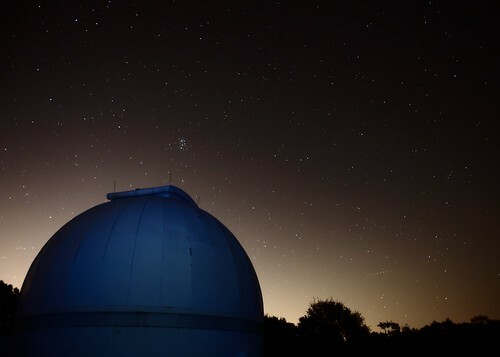 Our George Observatory is a little-known but not-to-be-missed experience – nestled in Brazos Bend State Park, far enough from the city lights that you can still see the wonders of the cosmos with your own two eyes. And beyond that – you can get a closer view of planets like Saturn (remarkably radiant right now) through the Observatory’s Gueymard Telescope – one of the largest in the country that is available for public viewing. I live in Richmond (far SW Houston Area) and so Brazos Bend State Park (including the George Observatory) is in my back yard and is my local photographic stomping ground. It is one of the hidden gems of the Houston area and I frequently visit it around sunset when the bird life and light are amazing. On the night I captured this image I had recently received some new camera gear and this was my first chance to try star photography with it. I hung around in the COLD waiting for the sun to finish setting. Once it had, I spent several hours (yes, hours) taking a few shots around the observatory. An observatory in front of stars is a classic shot. When you are new at something, try what you know works first. *The shot was captured on a tripod. *The dome of the observatory was lit with a small LED light. *The glow in the sky is Houston. *The image was shot in RAW and processed using UFRaw. Visit our George Observatory any Saturday night! When the weather is clear, there’s no better view of the universe. You can see more of Andrew’s photography on his blog. Previous Post Get your hands on science!